﻿ What It Means To Personalize Your Email Messages » Red Mango Marketing! You often know their names, personal preferences, and you enjoy interacting with them. After doing business with you, they leave with a smile. Join us for a FREE webinar, How to Create More Personalized Email Messages for Better Results. What about you? 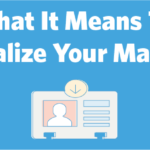 Are you using any personalization in your email marketing? Tell us what works for you in the comments. The post What It Means To Personalize Your Email Messages appeared first on Constant Contact Blogs. This entry was posted on Friday, March 9th, 2018 at 8:00 am	and is filed under email design, Email Marketing, News & Updates. You can follow any responses to this entry through the RSS 2.0 feed. Both comments and pings are currently closed.